I hope all of you are happy today. This is the first Halloween that my son Jonathan does not want to go "trick-or-treating". He wants to show me he is a Man now. Jonathan will be thirteen in December. He is always a sweet kid to me, Oops, I hope he is not reading this. In case you do, Jonathan, I want you to know that mom and I love you very much. Since I am in the mode of doing high key paintings, why don't I go a little further? This painting does not have much of dark areas. You know I love to use dark value and colors to enhance the contrast. Well this one is the opposite. The value range is rather limited. All colors are very similar in value. The reason I did this is that I got opportunity to have many soft and lost edges. Impressionistic painters did this kind of thing a lot. But some of them went too far, and the forms went away. I want to keep my forms as accurate as possible, but the edges can be as soft as possible. Based on my small study posted previously, I did this one. 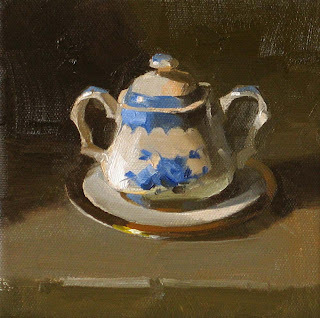 It is slightly larger and it will be showing in the InSight Gallery at Fredericksburg, TX. This is relatively new gallery, but they have wonderful wonderful art showing there. If you happen to in the Fredericksburg area, please check it out. Your time will be well spent. Guaranteed. Above my head, mercury lights are buzzing out radiation, paled like a dead face. In front of my eyes, computer screens are flickering dazzling color, contentless information. Cubicals form a giant labyrinth, guiding the WiFi passing through. Engineers manipulate the invisible stricture, cranking photons into dollar bills. Caffeine drives the whole industry moving forward and one piece of junk barters multimillion.......This is my world. This is my October....... But sometime, I cheat. This is my painting. This is my October. 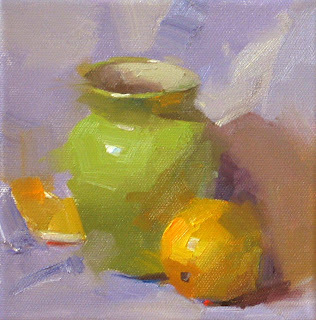 I am back to still life painting again, and continuing my study on colors. 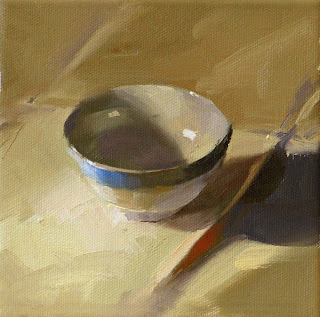 With this simple white bowl on a piece of white clothe, I tried hard to find opportunities to use as much colors as possible. Man! It was hard. I was wondering if I really see colors or just hallucinating. After I posted my turp container question. I got so many answers. I really appreciate all of you willing to help me. Now I want to feed back you the best answer I think. I created a new page in my website called "practical tips". Please check: http://www.qhart.com/Q_and_A/Turp_container.htm. If you have the similar problem, may this tip helps you as well. I will put more tips on this page in the future. I got it from you, so I would like to give it back to you. 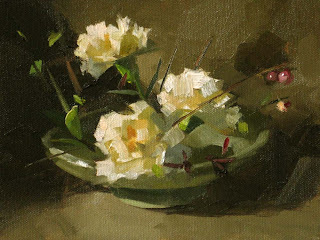 This one is another plein air I did at Fort Worth. Since my last post, many of you have commented and emailed. Your messages warm my heart. I really appreciate your support. I feel so lucky that I have so many friends "traveling" together with me. Thank you so much. Well today, I want to ask a piratical question to all my plein air painting friends. I am trying to find a sealed container to carry mineral spirit for my plein air trips. So far I have not found one that does not leak. What do you use to hold your turp or mineral spirit without leaking? 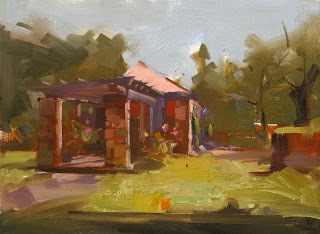 This is another plein air I did at the Fort Worth Botanical Garden. Last Friday evening, I was traveling from Austin to Fort Worth. The traffic was horrible. Bumper to bumper, I was in traffic jams constantly. It took me more than five hours to travel 150 miles. When I was crawling on the high way, I thought about my career as an artist. It has been a rather difficult journey. I ran into limitations all the time. 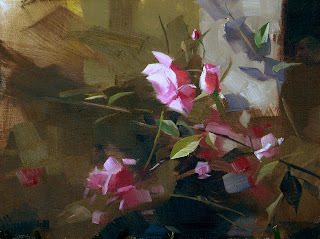 I wish I could paint more, I wish I could study with Richard Schmid and several other high caliper artists. I try to use every minutes I have, and I am in fatigue all the time. The frustration is exactly like the traffic I am in. My car can go 70 m/h easily, but I can only go 20 m/h now. I guess that is life. I should be content that I am still moving, because I am already very very lucky comparing with many others. I went to the Ft. Worth Botanical Garden last weekend and participated in the Camp Fire USA paint-out. I really enjoyed two days plein air painting. This one is my quick draw piece. I have not fully developed my plein air skills yet, but I surely enjoyed this event. 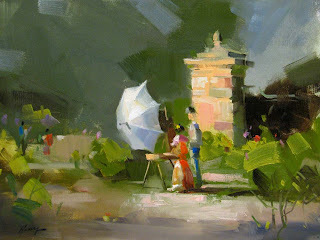 I met quite a few very good plein air artists this time and learned a lot. 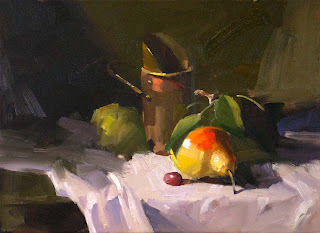 This painting is not bad, I started to have some feeling about plein air paintings. It is good to have a change. This is the second demo I did. As a matter of fact, the workshop at Duncan, Oklahoma was my last one for 2009. I did nine this year, and I enjoyed every minutes of them. Teaching is different from painting. I tried hard to make sure my information is tangible. Philosophies are not always need to be esoteric. A teacher's job is making them down-to-earthly understandable. I believe that art can be taught and learned. Knowledge and skills are the wings of your creativity. I just came back from Duncan, Oklahoma. I enjoyed so much teaching this 3-day workshop. Jolene Forbes was so wonderful organizing this one. Thank you very much. I appreciate so much that the Duncan Art Guild and Jolene for giving me this great opportunity. 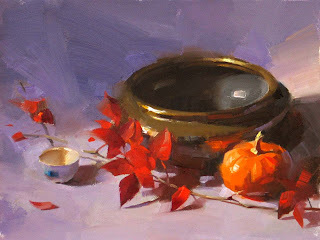 I want to thank all the Oklahoma artist friends who attended my workshop. I hope you all find my teaching useful, and hope to see you again in the future. This is my first demo at the workshop. Please enjoy. This painting is rather simple. 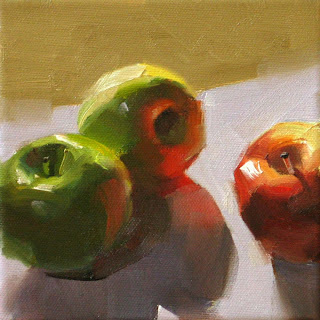 The main purpose I do this study is practicing color harmony. 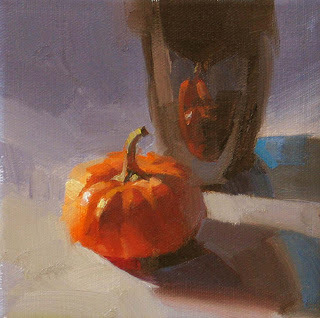 Believe it or not, I put lot cadmium orange into all colors I used for this painting, including the blue. The reason for that was I saw a lot of orange in my light. Does the painting look orange to you? Maybe not, but it definitely in orange harmony for sure. Tomorrow, I will go to Duncan, Oklahoma to teach a workshop. 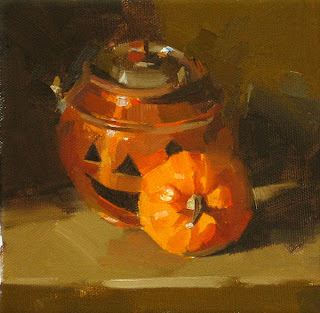 I will share some of my demo paintings soon. 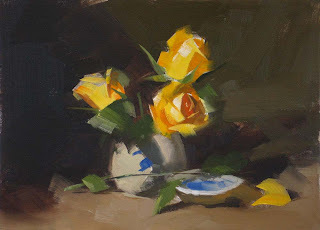 I received many positive comments on my color study. They make me more confidence that I am not "going to far". My today's painting is another example. This time I paid more attention in the casting shadows. Instead of making them very dark, I really examined the colors. I think life is the same way. In some part of our life, we are in darkness. We are long for light, but not always can get it. Why don't we examine more the shadows we are in. It gives us the richest experiences, and we become more mature. I recently signed up "Facebook" and "Twitter". Be honest to you, I know nothing about them. I know many of you are experts of the social network thingys, so I need help from you. Could someone tell me how to synchronize blog, facebook, and twitter together? I googled, but have not found much help. Someone said using "Notes", well I don't see it on my facebook pages. I googled more and learned "Notes" is a type of "Application". Well I don't see any tab or link of "Applications" on mine. I googled for "facebook tutorials" and got tons of sites and videos, but their facebook seems different from mine. I finally learned there are something called the "NEW" facebook, and I haven't seen much help on the newface yet. ...... I looked at my watch, I gave up. I painted some flowers. Time was much better spent.